NorthernAxcess brings the Iridium GO! Global Roaming Kit that come with the latest high quality Iridium GO! Wi-Fi hotspot device, 400/200 worldwide prepaid minutes and a Watertight Hard Case. With the Iridium GO! you can connect your smartphone (like an iPhone or Android phone) right to your satellite feed via Wi-Fi. Enjoy Global Roaming with this complete kit and communicate without limits. The Worldwide Iridium Go! 400/200 minutes card is valid for 6 month from the activation date. You can activate the card within 90 days. When purchasing this kit you will not pay any activation fee. The Hard Case will protect your Iridium GO! from harsh weather conditions, dust and debris. Worldwide Iridium 400/200 Iridium GO! This prepaid sim card offer low rates and global coverage with no contracts for iridium GO!. This sim card is valid for 6 months from the activation date. The Iridium GO! Worldwide Prepaid Plans provide an ideal solution if you're working on short term or seasonal projects or if you are a worldwide traveler because this plan has the same rates for all countries and continents. The Pelican iM2050 Case is designed to protect your Iridium GO! from harsh weather conditions, dust and debris. The insert will also ensure that your Iridium GO! is not moving loosely in the case while you are traveling. Learn more about Iridium GO Airtime. What can you do with the Iridium GO! Make phone calls on your smartphone just like you would over a cellular network. Check and send compressed email on your smartphone or tablet. Text and send SMS messages on your smartphone. For climbers and adventurers, individuals, enterprises, or governments, for anyone who is on the move, out of range or off the grid by land or sea, Iridium GO! enables reliable voice and data capabilities for your smartphone or up to 5 mobile devices. You can take Iridium GO! anywhere. It's small enough to fit in your pocket and, like other Iridium devices, tough enough to withstand rain, sand, dust, and rough use. It can be carried, easily stowed in your backpack, or mounted in vehicles, aircraft, and boats for mobile applications. The Iridium GO! has integrated GPS for GPS tracking over the entire planet. Tracking can easily be enabled for the unit allowing you to see, in real time or near real-time, your position on a dedicated individual web-page where family or friends can track your location. iOS 6 & 7, Android 2.3.x Gingerbread, 3.x.x Honeycomb, 4.0.x Ice Cream Sandwich, and 4.1.x/4.2 Jelly Beam with updated versions to be made available to follow Android releases. 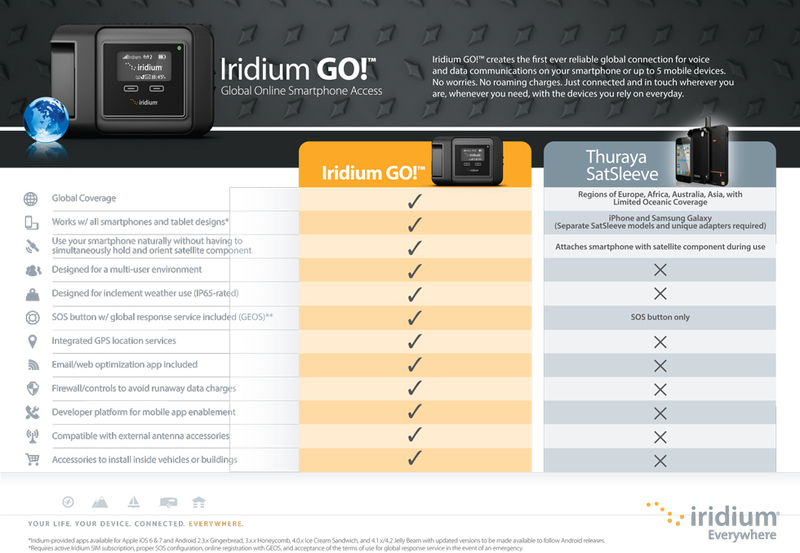 Click the button below to add the Iridium GO! Global Roaming Kit w/ Case & Airtime to your wish list.